Google updates its Android distribution numbers for September 2015 this morning, showing a jump for Lollipop (Android 5.0+) from 18.1% to 21%. While no where near 50% or a number that would make Apple and Tim Cook angry, we are closing in on the quarter mark. Hey, it’s something! As for the rest of the Android versions, KitKat sits at 39.2%, Jelly Bean 31.8%, Ice Cream Sandwich 3.7%, Gingerbread 4.1%, and Froyo 0.2%. 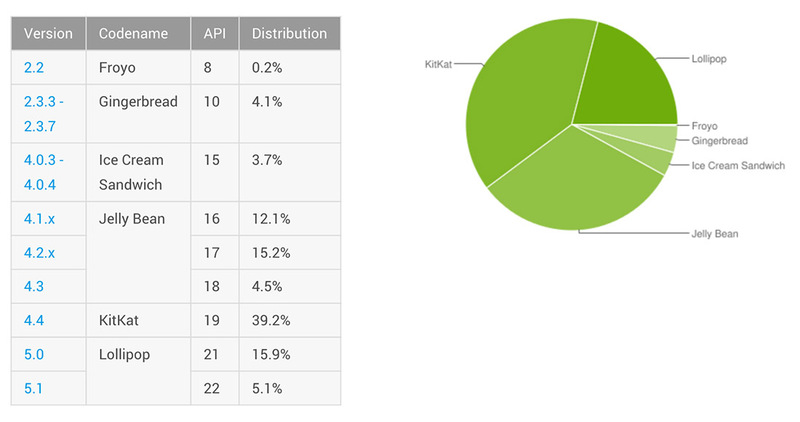 Last month’s Android distribution numbers can be seen here.